This post needs a disclaimer: I’m a huge Parks and Rec fan. HUGE. I gave out ovaries before brovaries pins at my bachelorette party, we have a mirror hanging in our hallway hand-lettered with “I love you and I like you”, Kyle and I constantly sing “the wooooooorrrrrst”, this totally started my celebrity crush on Chris Pratt, I’m a total Leslie, Kyle is definitely a mix of Ron and Andy, we’ve watched the entire show at least 4 times through and “everything hurts and I’m dying” comes out of my mouth after every wedding. Galentine’s Day is only the best day of the year. While I won’t be able to brunch with all of my lady friends this year * SOBS *, I definitely want to celebrate them and thank them for loving me, being there for me and just generally being awesome. So, I’ve compiled some easy and thoughtful ways to thank your best Galentines and make them feel appreciated and loved too! 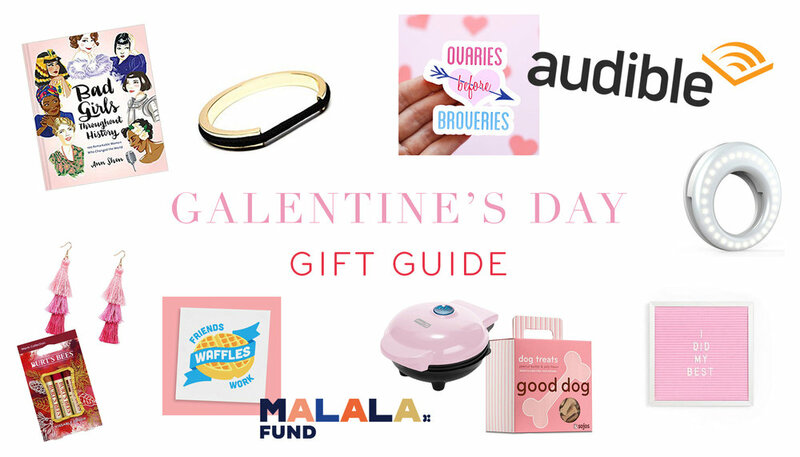 Alternatively… you should also be your own Galentine so TREAT. YO. SELF.